Are you looking for a fork lift rental? 123Forklift has 170 convenient locations across North America with over 5,000 forklift rentals in stock. Before you rent a forklift, you should know the different types and options you have. Pneumatic Tire Forklifts - Pneumatic tire forklifts are excellent for rugged terrain use. Their air filled tires with thick deep tread provides durability and can extend the operating life of the forklift. Cushion Tire Forklifts - Cushion tire, or solid, forklifts are ideal for indoor use. Their solid tires are long lasting, and provide for a smooth operation. Electric Sit Down Forklift - These forklifts are counterbalanced and come in a three or four tire option. Three wheels make this forklift very easy to operate in small areas. Narrow Aisle Reach Truck - These trucks are designed specifically for tight spaces. They can maneuver in aisles as small as three feet wide. Electric Walkie Stacker - Electric Walkie Stackers do not require a forklift license to operate. They are very quiet, and inexpensive. Electric Order Picker - Order Pickers are a convenient forklift when picking up individual items is needed frequently. They can also be driven and operated while they are in the raised position. Pallet Jacks - Pallet jacks are intended for transporting stacked pallets, and can be manual, or electric powered. Rough Terrain Forklifts - These forklifts are the best choice for uneven terrain. They are able to lift thousands of pounds and include a telescopic boom for reaching. Scissor Lifts - Another popular choice is the Scissor Lift rental. This platform moves in a vertical direction and provides easy safe access for workers to operate in an otherwise difficult work area. A scissor lift rental may be a good choice if you will need to reach a working area from 21 to 62 feet above the ground. Telehandlers - These forklifts are able to lift loads 6,000 to 10,000 pounds. They are also known as a telescopic or extendible reach forklift, as they are able to reach heights up to six stories. Forklifts come in two engine types: Electric and Internal Combustion. If you are looking for an electric fork truck rental you will most likely be using your forklift indoors in a warehouse. Electric forklifts are run by battery, and are emissions free. This is why they are the safest forklift to use indoors; safest for your health, and the environment. When looking for your lift truck rental, you should know the electric forklift’s battery has an average life span of 6-8 hours. You will feel the power draining from your forklift near the end of its battery charge, signaling the necessity of recharging. The battery will take approximately 8 hours to recharge, and will require an additional 8 hours to cool down. If you will be using your electric forklift for more than 8 hours of continual use you will need to purchase more than one battery. The second forklift engine type is Internal Combustion. These are engines that burn fuel similarly to cars and trucks. An internal combustion engine forklift can burn several types of fuels. These types are gasoline; diesel fuel; liquid propane; or compressed natural gas (CNG). If you are looking to rent a forklift for outdoor use, an internal combustion engine is your best choice. Due to the emissions produced by fuel burning forklifts, you will not want to use them indoors. Fuel powered lift trucks are your only option if you need a lift capacity of 15,000 pounds or more. Unlike electric forklifts, fuel powered lift trucks do not drain in power the way a battery will. They are easy to refuel, and it takes only minutes until your forklift is ready to operate again. There are three main types of forklift tires: Pneumatic, Solid (Cushion), and Polyurethane. The pneumatic tires are similar to a car or truck’s tires, in that they are filled with compressed air. They have a thick rubber layer with very deep treads making them ideal for outdoor use in any type of terrain. Solid forklift tires are just as they imply; solid. They are entirely rubber and can be used indoor or outdoor, but are most suited for indoor smooth surfaces. 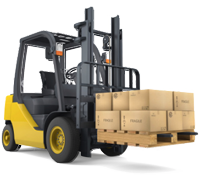 Polyurethane tires are very easy to use, they simply press on to the forklift. They are very durable and long lasting when used indoors, but will deteriorate quickly with outdoor use. We now make it even easier to find a fork lift rental in your area. Instantly search for fork lift rentals online by filling out our easy request form, or call to speak with a 123Forklift associate at 877-327-7260.